A ball is thrown at an angle of 45 degrees above the horizontal. 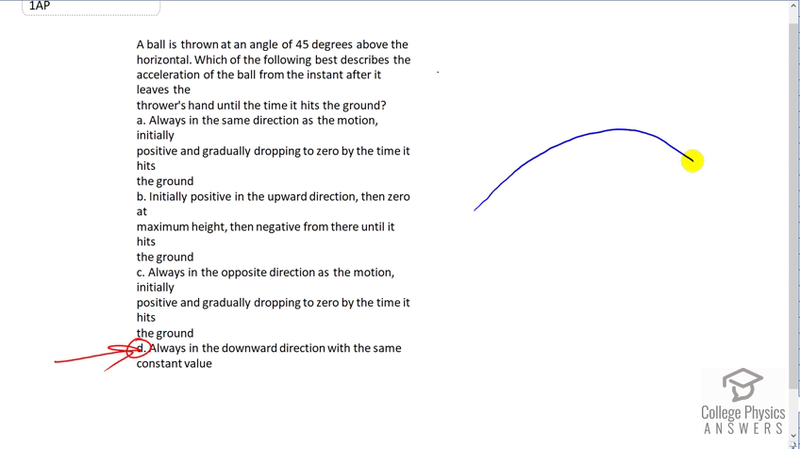 Which of the following best describes the acceleration of the ball from the instant after it leaves the thrower's hand until the time it hits the ground? This is College Physics Answers with Shaun Dychko. When a ball is launched at a forty-five degree angle or thrown at any angle into the air, despite having this curved path and a velocity that is changing as it goes, the acceleration is constant at all times. It is always 9.8 meters per second squared directed downwards and it never changes. So while the position changes and the velocity changes, acceleration does not. It's always in a downward direction with the same constant value.